Daniel Cleary's second straight 20-goal, 20-assist campaign was rewarded with a five-year contract extension, and he became the first Newfoundlander to win the Stanley Cup. The Detroit Red Wings got off to a roaring start in 2007-08. The ending wasn’t too shabby, either. With captain Nicklas Lidstrom leading the way on defense and Selke Trophy candidates Henrik Zetterberg and Pavel Datsyuk up front, the Red Wings racked up 115 points during the regular season before winning their fourth Stanley Cup in 11 seasons by defeating the Pittsburgh Penguins in the Stanley Cup Final in six games. Detroit had a dominant first half of the season, as it already had 61 points by the end of December. From Nov. 22-Dec. 31, the Red Wings had dropped only one game in regulation. Chris Osgood, who was playing for the same team that placed him on waivers in 2001, was named to the Western Conference’s All-Star team and finished the campaign with 27 wins and a League-best 2.09 GAA. Things were a bit bumpier in the second half of the season, mainly due to injuries. Incredibly, the Red Wings were forced to play at one point without defensemen Lidstrom, Niklas Kronwall, Brian Rafalski and Chris Chelios. They did, however, hold off the San Jose Sharks to win the No. 1 seed in the Western Conference and the Presidents’ Trophy with a record of 54-21-7. 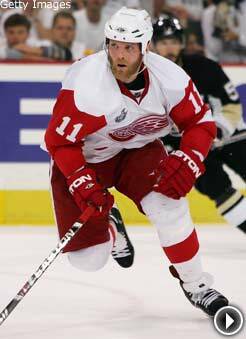 Daniel Cleary made headlines for the Red Wings, too, becoming the first native of Newfoundland to win the Stanley Cup. With an entire province in his corner, Cleary – who enjoyed his second straight 20-goal season and signed a five-year contract extension in March – skated on the team’s top two lines during the playoffs and showcased the versatility that made him so valuable. Johan Franzen was yet another bright spot for Detroit, as the man they call “The Mule” had a breakout season with 27 goals. Little did everyone know the best was yet to come, though, as Franzen scored 13 times during the Red Wings’ march to Lord Stanley. Franzen – who had two hat tricks in Detroit’s second-round sweep of the Colorado Avalanche – missed six straight games during the postseason due to concussion-like symptoms. Like most championship teams, moves had to be made along the way to the title. In need of a defenseman to aid an injury-depleted blue line, General Manager Ken Holland acquired Brad Stuart from the Los Angeles Kings at the trade deadline in exchange for a 2008 second-round selection and a fourth-round pick in 2009. While the acquisition of Stuart paid huge dividends, will the Red Wings be able to re-sign the unrestricted free agent, who made $3.5 million this season? If he bolts for greener pastures, how does Detroit fill the gap? Will Chelios, who was a healthy scratch for all six games of the final round, return for a 24th season? Chelios said he wants to come back, but will the Red Wings accommodate the 46-year-old defenseman? Chelios certainly hopes so. Get your 2008 Stanley Cup Champions locker room hat now! But defense isn’t the only question mark for the Wings this summer. While Osgood is signed through the end of the 2011-12 season (he’ll make $1.7 million next year), Dominik Hasek has announced his retirement. Will Holland hand the No. 2 duties to a youngster such as Jimmy Howard, or will he attempt to bring in an Olaf Kolzig to shore up his netminding? While Datsyuk is slated to be in Detroit through the 2013-14 campaign, Zetterberg, the team’s other Selke Trophy candidate and Conn Smythe winner, will become an unrestricted free agent after next season. Can the Wings lock him up before then, and at what price? With Datsyuk, who led Detroit with 97 points and a plus-41 rating, being paid $6.7 million each season, do the Wings give Zetterberg the same offer, or do they offer him more than his gifted linemate? For now, though, the Wings should enjoy their latest championship. Lidstrom became the first European captain to hoist the Stanley Cup. Two players – Lidstrom and Datsyuk – finished the regular season plus-40, and plus-41, respectively. Rafalski had 55 points in his first season in his native Michigan and played a huge role in the postseason. Osgood showed he can still play this game at an elite level. But considering no team has repeated as Stanley Cup champions since the Red Wings accomplished the feat in 1997 and 1998, it won’t be long before the champagne sipping comes to a conclusion and the construction of next season’s squad begins.